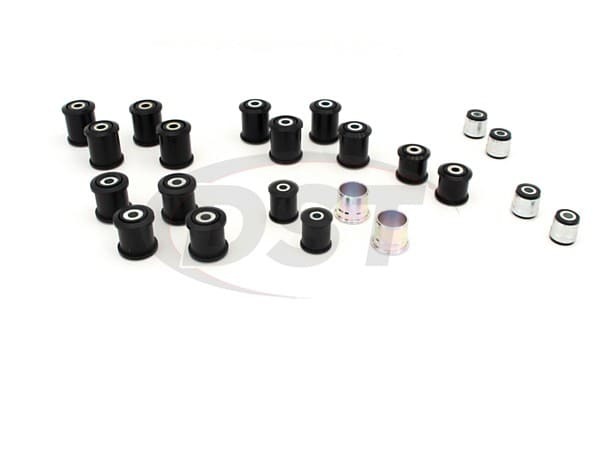 There are several brands that manufacture Front Control Arm Bushings for your 2007-2014 Jeep Wrangler JK. 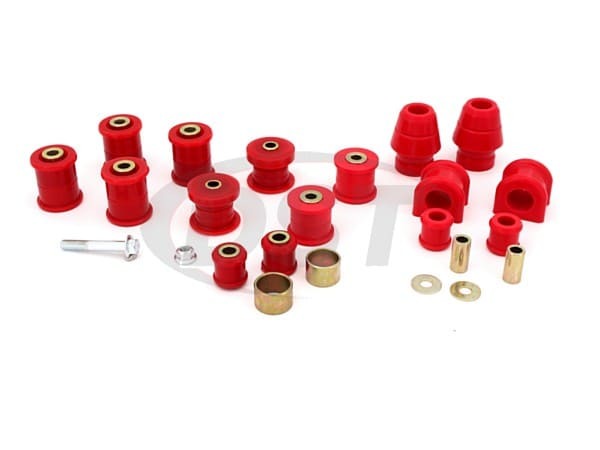 They range from complete replacement kits to individual bushings, depending on whether you want to poly out your suspension or quickly fix a broken piece. Some are more suited for off-road enthusiasts while others are meant for the daily driver. Whatever the case, we’re going to take a look at several of these options and give you a better idea of what is available. 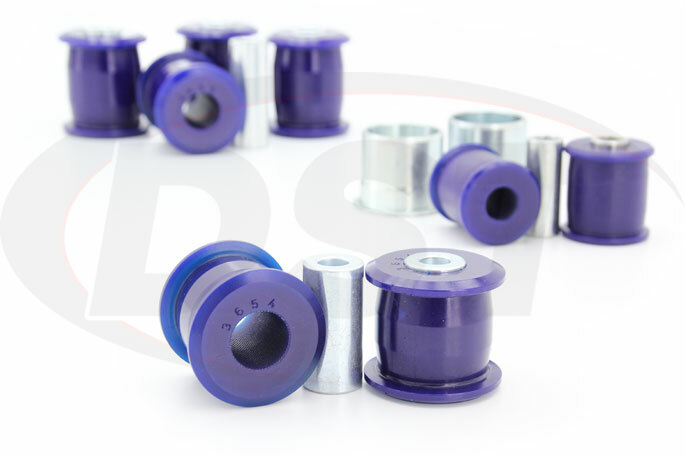 We have chosen just a few different criteria that are important for these parts across the board but all of these bushings have many facets that separate them from the others. 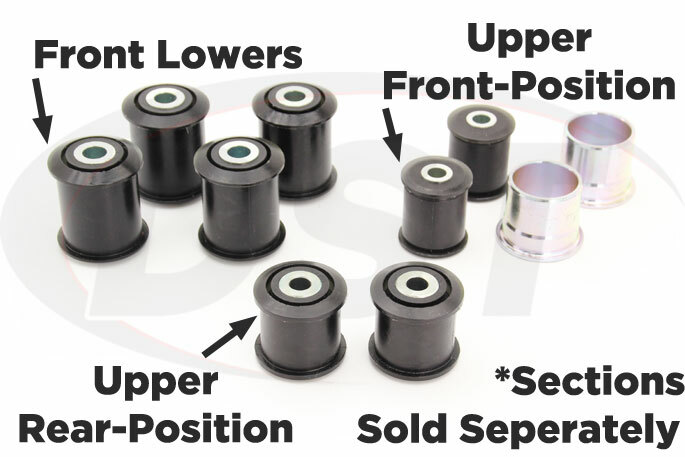 If you want all the most intricate details about these front control arm bushings for your 2007-2014 Jeep Wrangler JK you can call the manufacturer directly or the customer service folks at Suspension.com who can either answer your questions or direct you to the correct source. Prothane is based in California where all of their R&D, design, and manufacturing takes place. They do everything in-house and do not outsource production to factories in other countries, so if “Made in the USA” is what you’re looking for then Prothane has you covered. 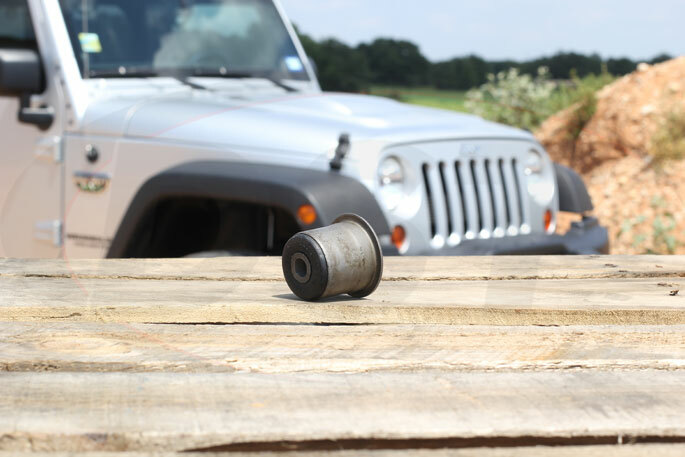 This kit uses an 85A durometer polyurethane to provide a more secure camber angle than rubber will and are under warranty to last the life of your Jeep. If you’re looking to move from a softer ride to a more durable, alignment holding suspension then this kit will give you all the pieces for your Jeep’s front control arms without having to check individual parts for fitment. The bushings are easily installed with two half bushings going in on each side of the housing being held together by the bolt. The inner sleeves that come with the kit are zinc coated, but the original outer shells will need to be reused. 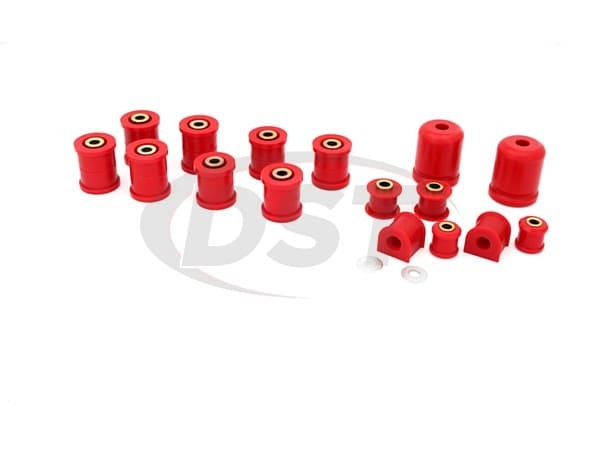 The inner surface of the bushings are cross-hatched or rifled to help hold in the grease that comes with this kit, meaning you are less likely to hear any squeaking from these bushings when your suspension travels. Whiteline doesn’t package their parts as kits because they do a lot of business in Australia as an OE replacement brand and garages do not want to buy an entire kit to replace one broken part. This might be off putting for someone who is replacing the entire front suspension since, in this instance, they would need to find three kits to complete their project. 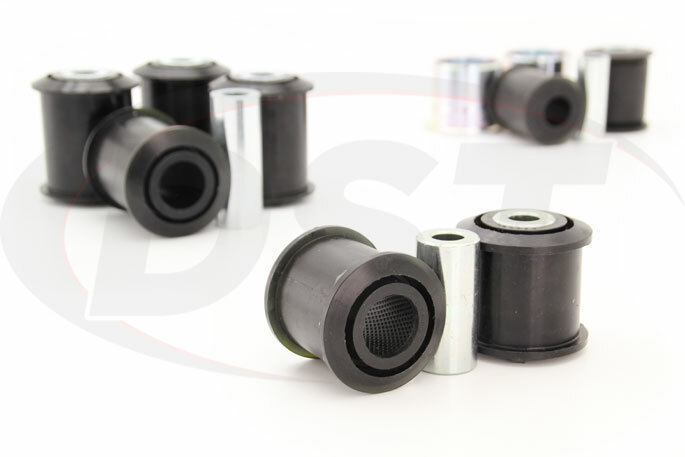 American companies usually market their bushings in kits since they cater to aftermarket customers who want to replace all their bushings at once for a performance increase instead of a simple replacement. Regardless, Whiteline does offer all the parts needed to re-bushing every position on the front control arm. They just have to be purchased separately. These bushings are installed traditionally by using a press which requires a more extensive garage for DIYers or a trip to the shop. The inside of the bushings are “cross hatched” to retain grease for longer periods of time between maintenance. The W63434 includes the outer shells but the rest of the original hardware must be reused. 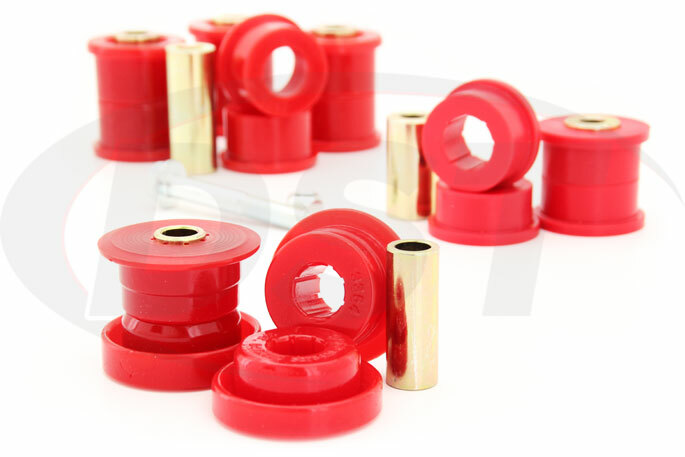 Whiteline offers a lifetime warranty on these bushings. Energy Suspension is another “Made in the USA” company that is well known in the aftermarket suspension world. They package their bushings in complete kits so you don’t have to scour the catalog checking fitment of different parts. This kit will cover all the positions of your Jeep Wrangler’s front control arm, though you will need to save the original outer shells for installation. These bushings are another potential DIY project since the halved bushings don’t have to be pressed into the housing. The lower bushings will have to be greased well on install since Energy Suspension uses a smooth bore inner that doesn’t retain grease as well as some brands. Without adequate grease the bushings might squeak but the idea behind this is that any displacement of material from the inner can affect the integrity of the bushing. Energy Suspension prides itself on being a performance option and uses the hardest durometer (88A) of any of the parts on this list, so it should provide the most rigid hold on the control arm. This means the camber angle shouldn’t change except in the most extreme cases, but you will also experience more noise and vibration, so deciding what on your acceptable level of comfort vs performance will be important. SuperPro’s 83A and 73A bushings are noticeably softer than other polyurethane bushings and the Barrel Body design allows for greater articulation of the bushing and more grease retention. 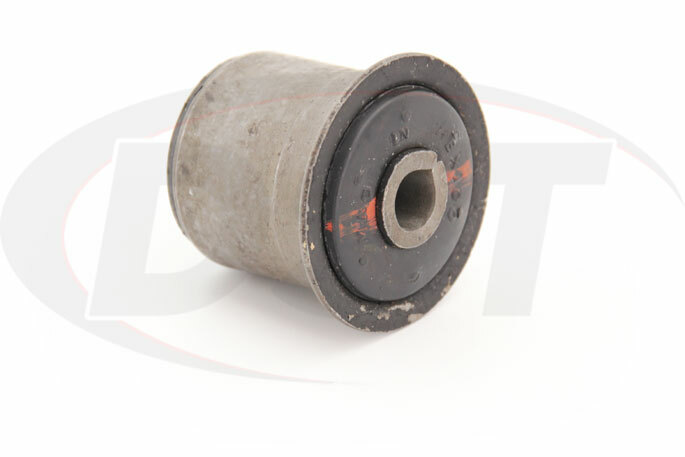 These bushings are aimed toward the weekend rock crawler that has a good distance to travel on blacktop before hitting the trail. SuperPro tries to strike a balance between comfort and durability, providing a smooth ride that lasts and holds wheel alignment. Like other Australian manufacturers, SuperPro sells their parts in individual kits. This can make finding the correct fitting parts a pain if you’re replacing all the bushings in the front control arms, but if your have an 07-14 Jeep Wrangler then these three kits will get you all the bushings you need. These bushings have to be pressed into the housing but SuperPro claims that if they are adequately greased upon install they will not squeak for the life of the bushing without re-lubricating. SuperPro also provides one of the best lifetime warranty’s in the industry since it is still valid with racing and off-road applications. If you’re looking to abuse your Jeep then these bushings will be covered no matter what. This is the only rubber control arm bushing replacement option we are going to look at today and it’s manufactured by Moog. Suspension hardware like ball joints and control arms are Moog’s bread and butter but they also manufacture bushings that are OE equivalent or better. They do not manufacture polyurethane products but their replacement options do meet or exceed OE specs and are the cheapest option by far. You don’t get all the wonderful benefits of polyurethane like extreme longevity or an unflinching hold on your control arm’s alignment but you do restore the comfort level of your ride for a percentage of the price of an aftermarket polyurethane bushing with no maintenance. Moog only offers bushings for the front upper position which are sold one piece at a time, so to replace both front uppers you will need to buy two bushings. They must be pressed in which can be a hard job to DIY, but you save money at the sales counter which means you can afford a little more at the shop. These are a “daily driver +” option that are meant to provide a cheap, but better, alternative to OE replacements. 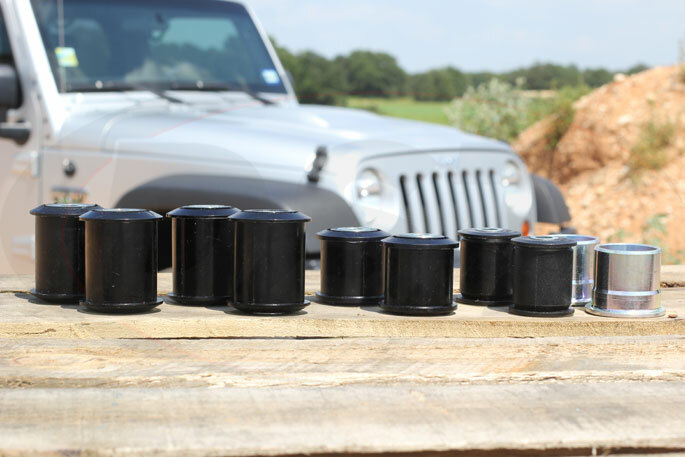 So Which one is the Best Control Arm Bushing Kit for your Jeep Wrangler JK? If you want a performance upgrade on the cheap. Energy Suspension and Prothane both offer complete kits which take care of all the positions. Energy Suspension is cheaper with a higher durometer for the most rigid connection. Prothane has grease retaining technology in all of their bushings and a lower durometer for a potentially softer ride. If you dont have a preference for the brand, the Prothane Front Control Arm Bushing Kit is a solid choice for your Wrangler JK in this case. 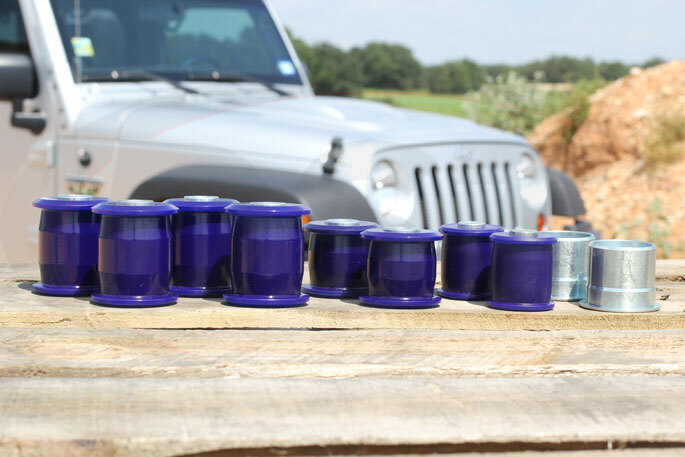 The native lifetime warranty will ensure you get the most from these for the life of your Wrangler JK – while the grease retaining inner diameter will keep them quiet without regular reapplications of grease. If you are a rock crawler and like to roam where there are no roads. Unfortunately, the SuperPro parts are also the most expensive of the bunch. At a cost of almost double the Energy Suspension and the Prothane replacements, you might skip this kit if you’re not going to be driving offroad regularly. If you want OE ride quality. For ride quality, the winner here is clearly Moog. 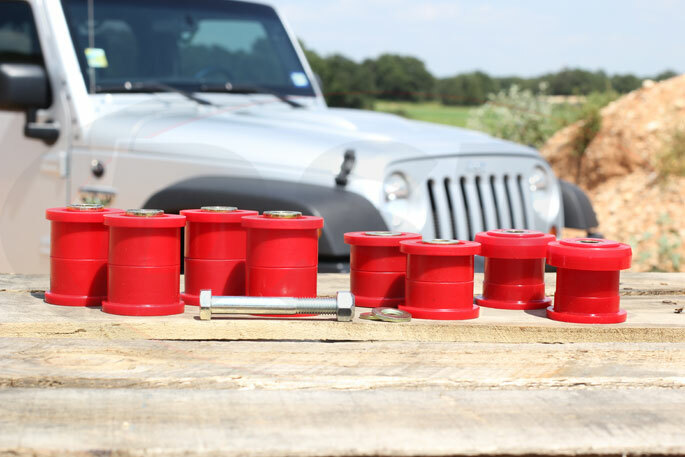 As the only rubber control arm bushing replacement option, the Moog parts are the only ones that will restore your JK with a ride that will closely match that of when your Wrangler first pulled off the lot. The Moog control arm bushings are also the cheapest option for replacing the front upper bushings, hands down. Just keep in mind that the Moog part also carries the worst warranty of the bunch as rubber is bound to fail sooner or later. Here’s the downside though. Moog doesn’t offer replacement bushings for the lower control arms. If you want new MOOG bushings for your lower arms, suddenly you’re stuck with buying an entirely new front lower control arm for your Jeep Wrangler JK. The oddball in the bunch. When compared to SuperPro, Whiteline’s grand total cost for the three positions is cheaper then the SuperPro kit by about 20%, but their warranty doesn’t cover racing and offroad 4×4 usage and that’s really the point of the SuperPro kit in the first place. That said, if you were really concerned with price in the first place, you’re probably going to jump the Energy Suspension or the Prothane kit which are both about 30% cheaper than Whiteline while still providing the same warranty. Because the Whiteline replacement Control Arm Bushing kit doesn’t particularly shine in cost, warranty, or even completeness – Whiteline remains as an oddball in the group that despite being a quality product, doesn’t really have a reason to recommend it above another kit. 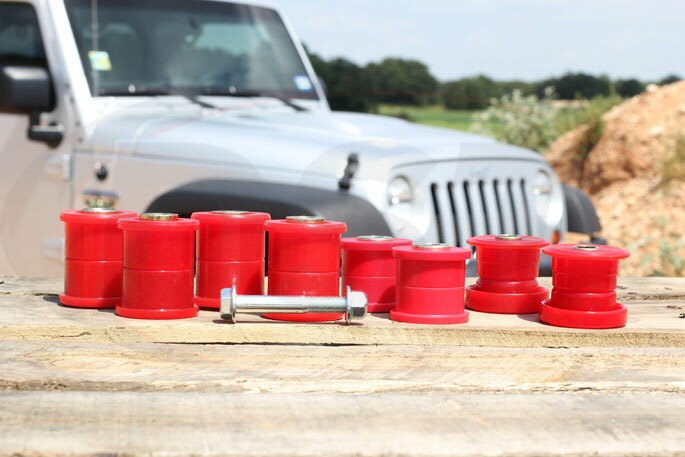 Thanks for taking a look at our overview of your options for the best replacement Front Control Arm Bushings for the Jeep Wrangler JK. 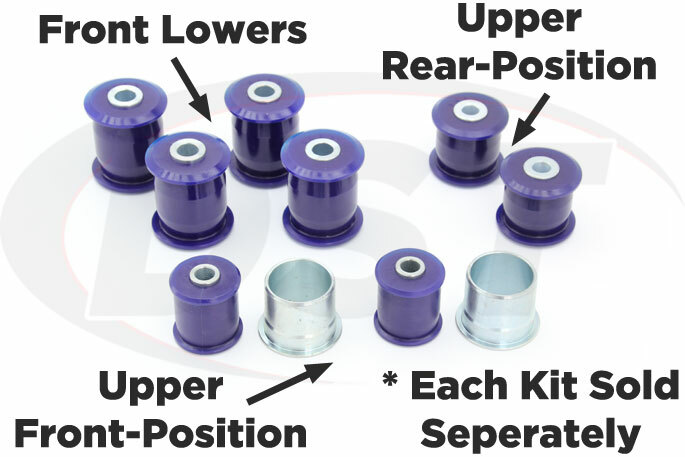 Now that you know the differences between your options, take a look at some of the slightly more complete replacement kits available if you want to take your bushing game up to the next level. 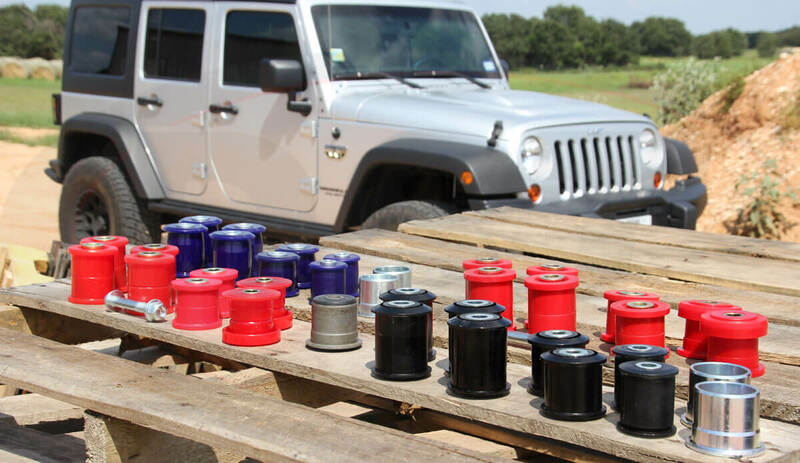 Each of these polyurethane bushing manufacturers offer kits that provide parts for the front and rear control arms, the front control arms + sway bar and bump stops, or the rear control arm bushings for your Jeep Wrangler. If you’re looking for specific parts then you have some options that you can get in a bundle to save you from searching for fitment and shipping costs.